A therapy dog may not sit on the couch and ask you how you feel, but she or he may sit on the couch alongside you at your psychotherapist's office if you are okay with that. Therapy dogs provide comfort and assistance to those who have illnesses, anxiety, and disabilities. Therapy dogs are dogs whose purpose is to provide comfort. At nursing homes, for example, therapy dogs may come in and provide affection to the residents. They have also helped out at hospitals, schools, disaster sites, and with people with learning difficulties and ​developmental disabilities. How Does a Therapy Dog Help? The comfort that a therapy dog provides literally helps the brain relax. Much like healthy relationships with others alter how our brains function, the presence of the therapy dog can have an impact on the various neurotransmitters that one's brain releases. Oxytocin, for example, otherwise known as "the cuddle hormone," calms and soothes the nervous system, resulting in an increased ability to learn. It has also been found that therapy dogs can help reduce blood pressure and the amount of cortisol released, which has implication in a greater ability to heal. If a child is struggling with difficulty learning, it can be an extremely stressful experience to continually try to read or write or participate in a learning activity that does not come naturally. Because of their calming effects, a therapy dog can help soothe a child and feel more relaxed in order to assist in the learning process. Therapy dogs can provide comfort to the ill or soothing to the child anxiously struggling to read. Service dogs and animals also exist to assist people with disabilities but have different training criteria than therapy dogs. Service animals are specifically trained to perform tasks for someone with a disability. There is a great deal of confusion that exists about how a dog can qualify to be a service animal. Unless the service animal meets a set of minimum standards, she or he cannot be considered a service animal. Once such minimum standards are met, however, a service dog enables someone who has a disability to have greater independence. Someone who is blind, for example, can use a seeing eye dog to travel independently in a city without having to rely on an aide. 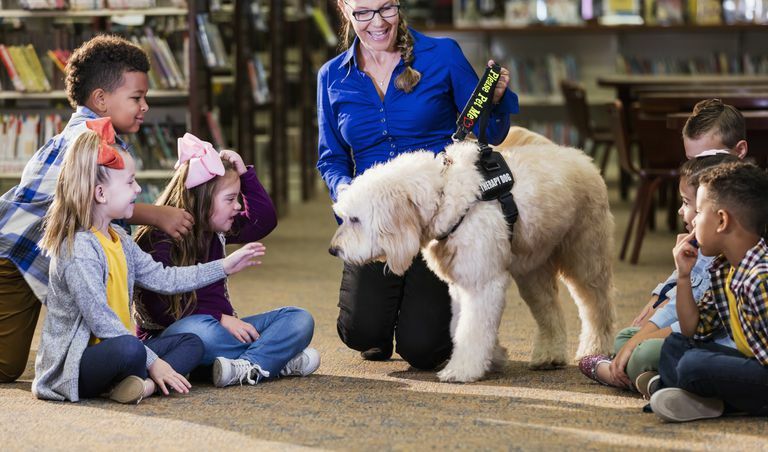 A child in a wheelchair, for example, can rely on the therapy dog to pick up a dropped item without having to enlist the support of another adult. This independence can result in greater self-esteem, increased sense of freedom, and a better quality of life overall. While many people are skeptical about the benefits that a therapy dog may have, research backs up their ability to calm, soothe and help heal. Beetz, A., Uvnäs-Moberg, K., Julius, H., and Kotrschal, K. (2012). Psychosocial and Psychophysiological Effects of Human-Animal Interactions: The Possible Role of Oxytocin, Frontiers in Psychology, 3:234. Esteves, S. W. & Stokes, T. (2008). Social effects of a dog's presence with children with disabilities. Anthrozoos, v21 i1 p5(11). How Can You Teach Math to Children With Disabilities?